Note: the MBA in Entrepreneurship & Innovation is offered at our Amsterdam location from September 2018. If you are looking to advance your career in management or start a new entrepreneurial pathway, or peruse a career in the innovation and strategic change management sector or department of a company, then the MBA in Entrepreneurship & Innovation will enable you to make the leap into new business and management roles from an existing position, or prepare you to enter a new role at managing a new or existing business, either as an entrepreneur, or an 'intrapreneur', helping an owner or startup to develop. The MBA in Entrepreneurship is one of the specializations in our international MBA program offered at Wittenborg to full-time and part-time students from the Netherlands and around the world. An international team of lecturers and business leaders has been designed this MBA for those ready to make the climb into management roles, either from an existing job or graduates with some work experience who are aspiring to become managers. Together with the traditional MBA building blocks, this MBA in Entrepreneurship & Innovation offers additional modules with a particular focus on entrepreneurship, strategy, and innovation.”. We welcome students from any academic or working discipline background to apply for this program. Many entrants to our Wittenborg MBA program do so with a science or technology background - it is not necessary that you have studied business or management before - the first semester equips you with all the tools you require to specialize further on the MBA in Entrepreneurship & Innovation. The modules are delivered intensively over consecutive days in the so-called 'block format,' which means that each module has 6 days of teaching split into two blocks of 3 days. Teaching methods include group work, case studies, presentations, and live projects. The course is delivered through a variety of approaches including lectures, presentations, tutorials and case studies, with an emphasis on interactive learning. Each module is taught by two lecturers, often a full-time Wittenborg lecturer and a guest lecturer from a partner university. Modules include regular guest speakers from industry. An entrepreneur in business can fulfill two main functions; the driver of new business ventures itself (entrepreneur), or the driver of innovation and change within existing business (intrapreneur). The profile only essentially differs between these two roles in the requirements of the level of ability to take risk and aptitude for taking the opportunity. Both the ability to judge risk and being aware of opportunity are competencies required at both ends of this profile’s spectrum. An Entrepreneur requires the ability to lead and motivate people. This will be during business start-ups and project launches, but also in times of change and innovation implementation. The Entrepreneur will understand the need for good communication skills and have a good understanding of society, economics and sustainability. The Entrepreneur will have skills of selling ideas and products, winning commitment, and presenting and executing business plans. Understanding the need for stable and solid management within a company, large or small is important. An entrepreneurial business person in modern-day Europe needs to be able to communicate with people across the continent and across the world and requires the ability to understand the effects of national and international governments on the business ventures they are involved in. 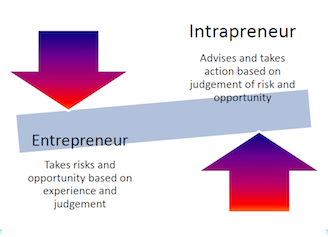 Entrepreneurs and Intrapreneurs need the ability to look at problems and risks from a holistic viewpoint and find solutions and manage risk through innovation. They need to have a good understanding of finance and fiscal matters and be able to knowledgeably communicate with people supporting them through accountancy, or human resource or information services, and be able to lead these people. Entrepreneurs and intrapreneurs are successful because they can quickly understand complex situations that require them to plan and make strategic decisions and work on a multitude of business ideas and projects at the same time. They have a solid understanding of marketing design and implementation. Being able to develop business ideas simultaneously requires an ability to determine and understand important details, pinpoint alternatives and continuously evaluate and review business processes. A characteristic of entrepreneurs is that they have the ability to fully devote and commit themselves to achieving their long-term business objectives and goals and that this energy is also directly translated into the short-term objectives. This is seen as someone who is committed to starting businesses and companies from scratch and making them a success. This is seen as a person who directs and manages a company, an SME. This could be the owner of a family driven business, or a business person who buys and takes over an existing business. This can also be an entrepreneur who has started a business through innovation and remains to direct and manage that company, without selling or leaving to start a new venture. This, extremely important entrepreneur is the most common non-executive entrepreneur in small business. 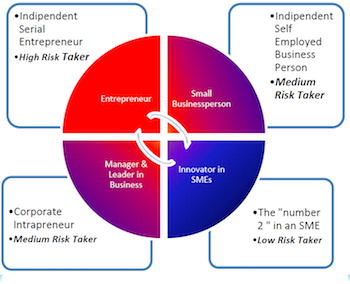 An entrepreneur, as the number 2 in an SME is a vital position as it enables the company to develop in an innovative and goal orientated manner, with a careful balance of risks and opportunities. This kind of Intrapreneur is someone who has had experience of business or project start-ups and project management and has now reached the moment where the experience and knowledge gained can be used to support another entrepreneur. This entrepreneurial role is becoming increasingly important within companies and organizations, as well as non-profit and governmental organizations, as they are forced to change, develop and innovate in the modern economy and business environment. Corporations require entrepreneurial business leaders who alongside their leadership qualities have a broad range of business skills and competencies and business administration knowledge. Applicants are required to provide a motivation letter in which they describe the reasons for choosing Wittenborg’s program, as well as the reason for wanting to study in the Netherlands (international students). Student motivation is important as the programs are demanding and especially for international students. There is a criterion that they complete at least 50% of all their credits in a year.